Bach in the Subways brings musicians from across the region to select SEPTA, PATCO, and Amtrak Stations for free, popup concerts. This past Wednesday marked the first day of spring, and next Thursday marks Opening Day — one means free Rita’s and the other means thousands of Philadelphians will pack Citizens Bank Park to see Bryce Harper. Both of those mean that, soon, we’ll be enjoying the outside a lot more than we are now. This week, Patrick Rapa took a trip to the Mutter Museum to see what overlooked specimens play a supporting role to top-billed attractions like the Soap Lady, the mega colon, and Einstein’s brain; James Jackson interviewed African American magician Ran’D Shine, who has several upcoming area shows; and gardening consultant Tina Sottolano-Cain told us how to successfully grow an indoor herb garden (begin by picking the best herbs for your house’s natural light). There are many ways to shake off your mid-March malaise this week: Help paint a mural in the Northeast, drink beer at a spelling bee, listen to Bach while waiting for the Broad Street Line, or put that binge-watching to good use and play Game of Thrones-themed quizzo at Boot & Saddle. Head to Mayfair this Saturday to help paint Mural Arts' latest project. Calling all spellers: Huntingdon Valley’s Naked Brewing Co. challenges you to partake in its first annual spelling bee. Registration includes a flight of all 12 of the brewery’s draft beers and entry into the contest. Food truck Bad Mother Shuckers will offer eats to keep you fueled. Hopefully the flight doesn’t become an obstacle to remembering the correct spelling of onomatopoeia. — G.D.
Trestle Inn, Callowhill’s time-honored whiskey and go-go bar, hosts this annual cocktail competition to raise funds for the PSPCA. Bartenders from the Ranstead Room, R&D, Irwins, and the Trestle Inn itself will mix drinks with Woodford Reserve. A ticket includes four cocktails, some free food, and a built-in $25 donation that’ll go to helping area animals. We’re hard-pressed to name a more compelling reason to drink. — J.L. The Trestle Inn's 7th Bourbon Battle goes down Wednesday, March 27, 2019. Heading into its second week, the nearly monthlong Israeli Film Festival seeks to bring insight into Israeli culture through a full lineup of documentary and feature films. Over the next few days, three different documentaries — focused on topics including terrorism, family identity, and immigration — will screen at various area venues, including the Ritz East and the Bryn Mawr Film Institute. Tickets for each event can be purchased online. — G.D.
Head to Franky Bradley’s on Sunday for a special burlesque show featuring an all-Latinx cast dressed to impress. Find Jewelissa, Mistress Lilith, Queen Yareli, and other lovely ladies on the Midtown Village venue’s stage for a variety show sure to beat another Sunday night on the couch. — G.D.
Less than a month from the release of Game of Thrones final season, it’s time to refresh yourself with the histories of families Lannister, Stark, Greyjoy, and Targaryen. Revisit a few episodes from earlier seasons, and then head to Boot & Saddle on Wednesday for a special adults-only GoT quizzo night. — G.D.
Nickelodeon’s Double Dare is headed to the Merriam Theater for two nights of slime-filled family fun. Popular TV host Marc Summers will emcee a live version of the show, featuring an array of physical- and trivia-based challenges. Do you think you have what it takes to run through the Double Dare obstacle course? A few lucky audience members will be invited onstage to participate. — G.D.
TV host Marc Summers heads to the Merriam Theater this Thursday and Friday for a live version of Nickelodeon's Double Dare. Wayne’s perennial “pleasure garden” reopens the gates to its 35-acre grounds this Wednesday. There will be far fewer peanuts and Cracker Jacks than at the Phillies’ Opening Day at Citizens Bank Park, but you can count on more serenity and less spilled beer. — J.L. Chanticleer Garden opens for the season Wednesday, March 27, 2019. If you’re taking public transit this weekend, consider timing your commute to this lineup of free concerts. The annual Bach in the Subways event sees talented local musicians performing live in select SEPTA, PATCO, and Amtrak Stations. Find oboists, flute players, cellists, violists, and more serenading travelers with Bach’s masterpieces. Check the website for performance times and locations. 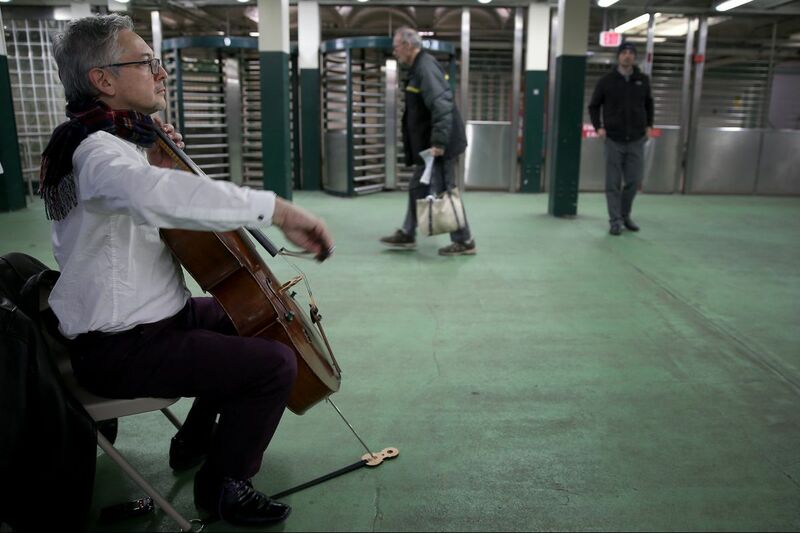 — G.D.
John Koen, a Philadelphia Orchestra cellist, plays at SEPTA’s Walnut-Locust subway station on March 23, 2018 as part of Bach in the Subways. Last year, Bon Iver toured to celebrate the 10th anniversary of For Emma, Forever Ago, Justin Vernon’s hushed debut, recorded in an isolated Wisconsin cabin. The two subsequent Bon Iver albums varied greatly: 2011’s Bon Iver, Bon Iver was expansive and layered; 2016’s 22, A Million was obscured and heavily Auto-Tuned. Two dates at the Met kick off a short nine-day U.S. tour, so we’ll get a first glimpse at how Vernon will meld the breadth of his succinct catalog of emotionally complex, haunted, and haunting songs. — S.K. Bon Iver comes to the Met Philadelphia for two nights, March 27 and 28.